When YOU need them and at a great Value. A local sign company with world class expertise, Signs By Tomorrow serves the Temecula and Murrieta area, extending throughout the Inland Empire and much of Southern California. From conception to completion – we do it – planning, graphic design, fabrication, and installation. You see thousands of signs each week. Which ones do you remember? Messages are often blurred - the temptation is to say too much. Messages must be to the point. When several lines of text are necessary, let the marketing professionals at Signs By Tomorrow present your message in a way that gets read. A banner screams "SALE - BIG DISCOUNT" in large bright letters on a major thoroughfare linking Temecula and Murrieta seen by thousands of cars each day. Great location - worthless message. What's on sale; the building, one of the business in the building? Signs That Work demand attention and ensure your customers don't drive past your business (and to your competitor's door) when they can't find you. Let SBT put your business on the map. 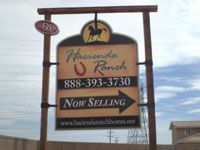 After several months of few sales, Hacienda Ranch teamed with Signs By Tomorrow to create a sign program to eliminate the backlog of homes. Weeks later the project sold out. Signs By Tomorrow is there when you need us. You know when your sign is needed; our job it to find a way to meet that deadline. We're quick - many of our signs actually are "By Tomorrow." Moon Valley Nurseries, taking southern California by the storm over the past several years, has learned that it can rely on SBT. Frequently SBT has provided dozens up to several hundred coroplast signs and banners to Moon Valley's dozen SoCal retail centers and growing yards (Temecula / Murrieta, Riverside, Orange County, Irvine, Escondido, Chino, Palm Desert, Hollywood, and Ventura County) within a couple days of order placement. This relationship has expanded with the shipping of signs nationally, and vehicle wraps on several dozen semi-trailers, stake trucks, box trucks, passenger vehicles and other assorted vehicles. Whether you need to promote, brand, recognize, direct, inform, regulate or persuade…our winning combination of state-of-the-art sign making technology, tried and true manufacturing processes, and years of signage craftsmanship will meet your needs. Read more about our exterior signs, interior signs, and services. Located in southwest Riverside County Signs By Tomorrow serves all of Southern California including San Diego, Escondido, Corona, and Orange County. You are so accommodating and helpful to work with. Quick response time. Sandy C., Mount Palomar Winery, January 2019.